Hat Saver is the best thing to happen to your hat. 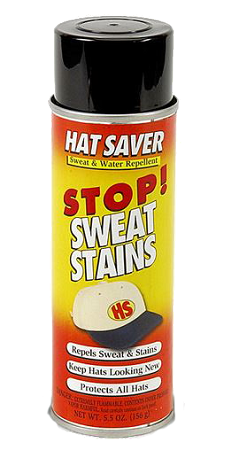 It stops sweat stains from coming through keeping your hats and caps looking new longer. This works on all types of hats as it can be applied to all types of materials including straw and leather. Hat Saver is Made in the USA and has been awarded "4 STARS" by Golf Magazine. I wish I had HAT SAVER a long time ago!! Few hats look the same after cleaning, and nothing will get you cleaning faster than a ring of sweat around your hat. HATSAVER works great. It's been a HOT summer, but you couldn't tell by looking at my hats!! Wish I had invested in this years ago. Would have saved multiple caps and hats. Hubby sweats in his head A LOT. He wears caps and hats and Hat Saver has been a great hat saver. Whenever he gets a new hat, he hands it to me to prep and then he wears with confidence. Great product! I have bought Hat Saver Repellent before but only used it on a few hats. I had a grey one on the other day that had been treated with the Hat Saver Repellent. After perspiring in it for a few hours I notice that there was an area I hadn't treated really showed the perspiration but the area I had treated show no sign of the perspiration. I just bought six hats and they all have been treated making sure I didn't miss any area. This is a great product and I highly recommend it. There has been nothing that I have ordered from Big Head Caps that hasn't been very high in quality. Keep up the good work. Wish I'd known about this before. I sweat a lot working outdoors and my hands are always dirty. I've ruined a lot of hats.